Abtech have many years experience in the design and manufacture of high voltage connection solutions for use in hazardous areas. Different sizes and options spanning the 5 main ranges in this High Voltage section mean that we are able to offer over 50 combinations. The entire Abtech HV range offers different connection options and mounting arrangements and as a result of customer demand, new variations are constantly being added to this popular range. Abtech high voltage enclosures and junction boxes are produced from grade 316 stainless steel and are rated to IP66 as standard. In addition, IP67 versions are available on request. Abtech high voltage enclosures are ATEX certified by SIRA and suitable for use in a Category 2/Zone 1 areas and Category 3/Zone 2 areas. 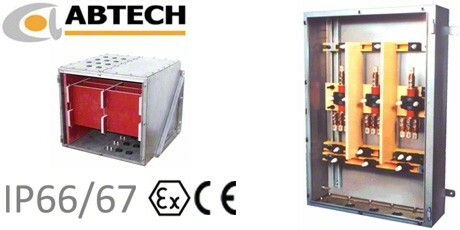 Abtech we can now offer Category 3/Zone 2 high voltage enclosures capable of operation at 35kV. Original Down Hole Pump Junction Box used worldwide.